Five nights a week, Taipei residents head to out to designated street corners, where the yellow garbage trucks will stop for a few minutes (and turn off their music), so that people toss their bags of trash in themselves. Despite the chaos that occasionally ensues when an entire street rushes toward the same vehicle, the collection system in place prior to this was far more unpleasant. 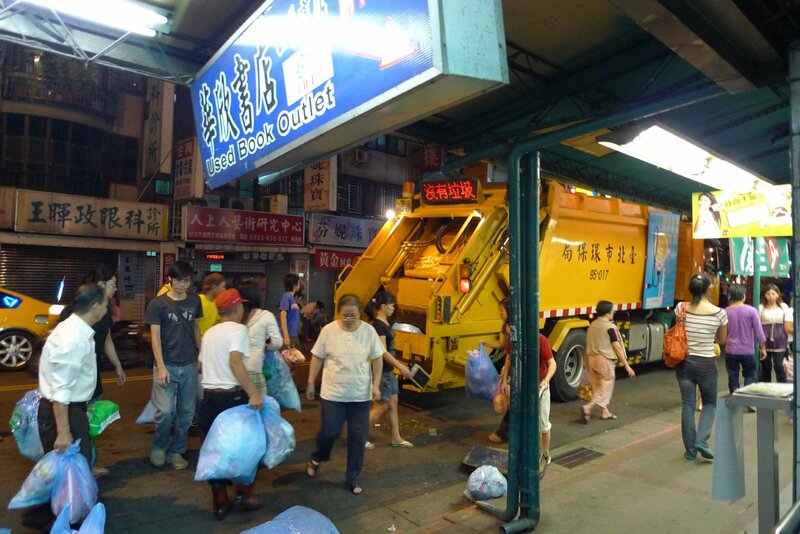 Before the singing trucks took effect in the 1980s, citizens of Taipei heaped their bags into large, pest-ridden dumpsters placed around the city blocks. Trash would spill over onto the street corners and fester in the tropical weather. The smell was terrible. And it attracted rats. Lots of rats. In the mid-1980s, Taiwan pushed for democratization, tried to expand industry, and wanted to attract tourists. They hoped clean streets would help cement their reputation as a member of the first world. During the resulting environmental push, Taiwan’s Environmental Protection Agency devised this new musical pick-up system, powered by the people and enforced with strict penalties for failing to comply. 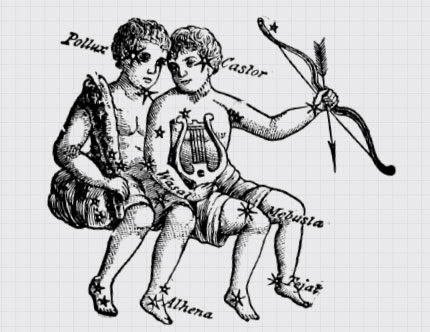 According to popular myth, “Für Elise” was chosen as the calling card because the head of the EPA at the time had a daughter who would practice it frequently on the piano. Today, visitors would never know the city of Taipei used to have piles of garbage strewn about the streets. Trash trucks come through regularly, stopping up to three times a day, five days a week on their routes around the city. After work or before bed, residents gather their waste, head to a designated street corner, and wait for the big yellow truck. 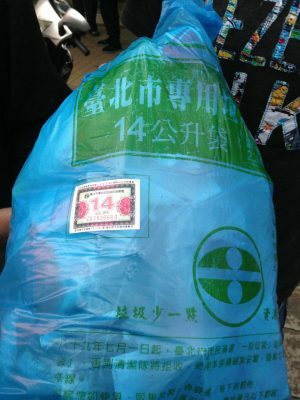 The trucks only accept trash bags officially sanctioned by the government of Taiwan which come in a distinctive blue color, complete with an official seal. The bags range in price and size, from 3 liters to 120 liters. The most popular bag is 25 liters (similar to a tiny bathroom wastebasket liner), which costs about $5 for a pack of 20. This effectively makes a pay-as-you-waste model, incentivizing citizens to recycle and compost as much as possible since those services are offered for free. 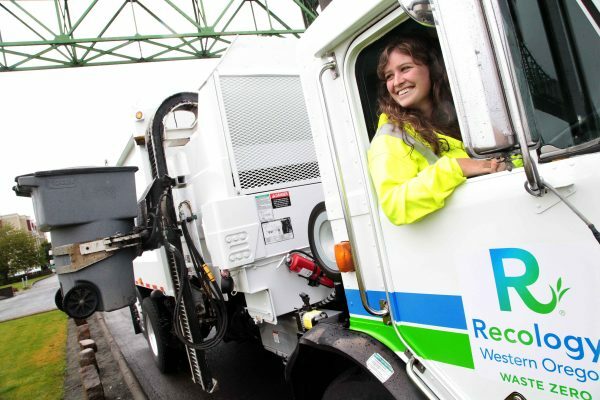 The musical garbage trucks are tailed by a recycling truck, where workers help the residents sort their recyclables and compost into thirteen distinct bins. Should people fail to sort their materials properly, the government will fine them up to $200. If this all sounds a little complicated and tedious, that’s because, well…it is. At least to an American ear. It’s hard to imagine a system like this working in countries like the United States. Every city in the US has a different method of trash pickup, but one uniting factor is that our pickup systems strive to be invisible. The trucks make great efforts to come when people are working or sleeping (or trying to sleep), and time their arrivals to minimize their impact on traffic. We take trash and recycling out to bins, toss it down chutes, or pile it in a dumpster, and it vanishes out of our lives, without a second thought. According to the Environmental Protection Agency, Americans recycle and compost about 34% of their trash, a lower percentage than most rich countries. This is in part because the different systems across the nation are disjointed; the US has around 9,800 different municipal recycling plants, each operating under a different set of rules put in place by their respective cities or contracted companies. That said, some American cities are doing better than others. In San Francisco, a private company called Recology takes care of the city’s waste, recycling, and compost. Their system, paid for by homeowners and landlords, manages to recycle around 90% of what can be recycled. 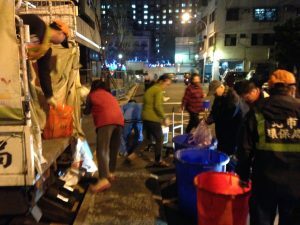 Recology has set up some similar incentives to the system in Taipei: for instance, trash bin pickup service is way more expensive than recycling or compost bin pickup service. 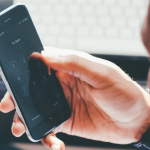 Still, though, Recology’s main focus is keeping customers happy, which means making the process as simple and stress-free as possible. So they send a truck to your curb to pick up your waste, and they don’t even expect you to sort your own paper or plastic. Instead, they collect it all, metal cans mixed with plastic bottles mixed with scraps of paper, and they send it off to their recycling center, which process over 600 tons of recycling per day. 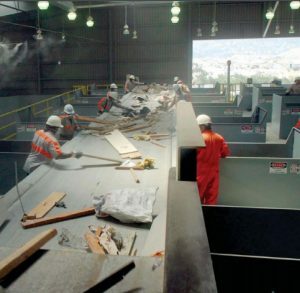 The recyclables make their way along a complex series of conveyor belts and get separated into 16 categories by a staff of 173 people … along a series of complex, automated systems. Recology’s specialized machinery uses everything from magnets to fish ladders to optic sensors to sort recyclables out. 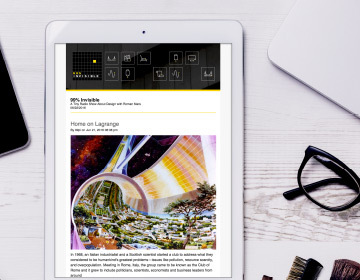 Using these types of advanced technology and employing a large workforce adds significant cost to their operation, which is then passed on to the consumer. However, this single-stream recycling also makes recycling easier for people who otherwise might not do it at all, perhaps because they’re confused about what type of plastic goes in what bin, or simply because they’d rather be doing something else. Each system has its own benefits and drawbacks, but Taiwan seems to be an example of a broad-scale revolution in waste management that has successfully taken hold with its entire population. Perhaps things would be different for Americans if we all had to watch our garbage pile up in our homes, without taking it out to a bin or throwing it down a chute—without it magically disappearing with relatively little effort on our part. It would certainly be a shift if we had to set aside time from our days to catch the garbage and recycling trucks coming down the street. We might, like Taiwan, start to produce less junk, or at least discover that we can recycle and compost more of the junk we do produce. But then again, hearing the same two songs, night after night, five nights a week, might also start to slowly drive us all insane. 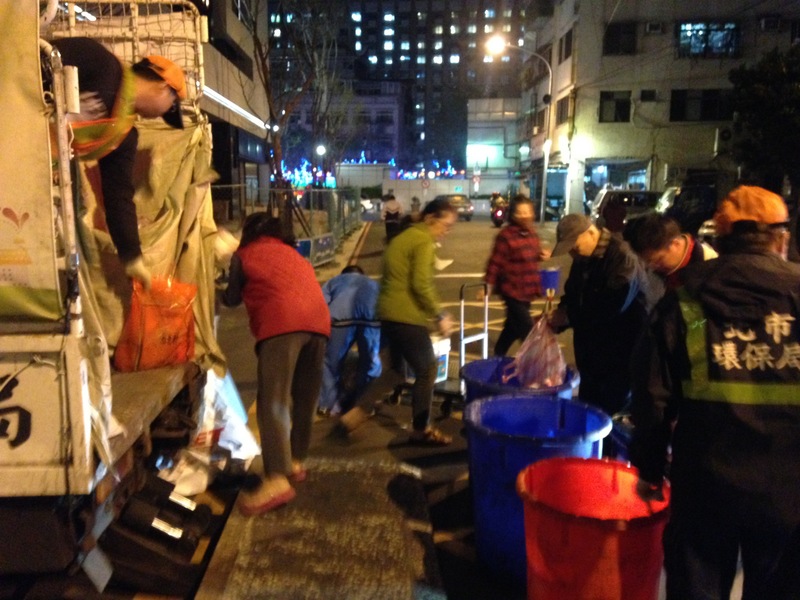 Producer Avery Trufelman spoke with Taipei resident Dr. Jasmine Huang; Mary Alice Haddad, Chair of East Asian studies at Wesleyan University; Taipei resident Erin Newport; trash collection supervisor Mr. Chen; and Robert Reed of Recology. I just listened to this episode, and I thought it was so interesting! I was disappointed at the end that there was little discussion on the ideas about environmentalism and democracy that this represents. I think the Taiwanese system is such a successful example of a people engaging in their democracy by equally accepting responsibility for their waste, and their collective effect on the environment. And they even carry out their duty by gathering around a shared song – I think that’s lovely. I think those are important ideals that Americans could take from this example, instead of seeing it as just a government that has employed its citizens as workers, or an annoying song interrupting your personal day. I think promoting that sort of change in mentality about efforts like these would contribute positively to the global discussions about our impact on the environment, and countries like America especially giving deeper thought to our responsibilities over our current comforts. Thank you for bringing light to this story! What are you doing that you need a 25 liter bathroom wastebasket? Thanks for another great episode. I once stayed at a friend’s house in Taipei. One night, she couldn’t come home to throw the trash so I had a chance to experience “Fur Elise” myself. However, instead of the mad dash to toss the trash in the right bin with a guy on the truck yelling at you (I wasn’t sure what to do), what I noticed while waiting on the street with the neighbors was how it was actually a pleasant social event for many people . I observed housewives gossiping, children horseplaying, and seniors greeting one another–it was indeed a nice bonding period with the people around you. It’s hard to imagine in a big city like Taipei, one can still experience this type of small town social interactions. And on recycle night, there are others who meet the truck, to take your recycling themselves to sell. The ones by my house in Tainan even throw your garbage onto the truck in exchange for what they can sort and resell. Hi 99PI! Thanks for this meaningful episode!!! I’m from Taiwan and live in Berkeley now. Just found out about 99PI recently and listen to this episode this morning like a nostalgic surprise! I was literally smiling on the street while walking to work. Being so used to the trash and recycle routine in Taipei, I was really confused how people do it here, and was also skeptical about throwing everything recyclable in one or two bins – now I understand why and how it works in the background! it made my day to hear your boys sing the garbage songs!! Oh, and the show was great. I happen to be a fortunate Recology client who can afford the service but I can see how this financial burden creates a disincentive, making recycling out of reach for most!! I’m glad this conversation is happening (but mostly I like hearing what your amazing children have to say)! After visiting Taiwan six months ago I only just managed to get the garbage truck song out of my head! But really, I was very happy to hear another story about Taiwan. 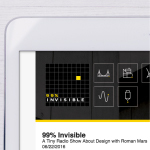 There could be a whole podcast just about the brilliant design solutions they’ve come up with. It looks like you guys fell in love with it as much as I did. Long time listener, heard this episode on iTunes today and it blew my mind! I’m from Taiwan myself and your insights about our garbage disposal system is amazingly accurate and profound! Great work! 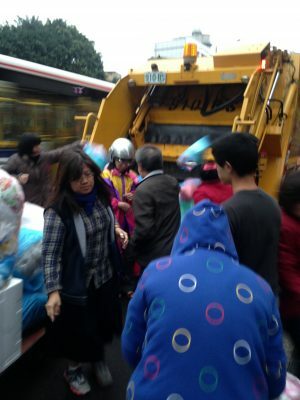 Garbage trucks in Taiwan were playing the “Maiden’s Prayer” tune well before the 1980s time frame mentioned in the article. I remember them playing the tune in the early 1970s when I lived in Taipei — just on 8 track or cassette instead of the current digital playback. The lack of understanding of costs was incredible in this episode. The fact that all of the voices given airtime praised the Taiwanese model of intruding on people’s time as “less expensive” truly illuminates the producers’ lack of understanding that time is inherently valuable, and that returns to scale typically reduce costs. It’s quite clear that the value of residents’ time in Taipei is not factored into this partisan calculus, and that only a cursory view was taken of the recycling market, without any willingness to investigate commonly held, but misguided assumptions known to anyone involved in the waste management sector. Further, solid waste is perhaps one of Earth’s least pressing environmental issues. When there are actual pressing issues to be concerned about, lamenting about the lack of recycling in the states, which has no lack of landfill space, is irresponsible and misguiding. I can only hope that 99 PI’s recent misguided political & moral foci are reduced, and that the show can turn away from such failures of normative analysis to return to its roots of interesting and excellent aesthetic investigation. Please take back “the state has no lack of landfill space”. This’s just ridiculous. It just happened not to be next door to you. Law of mass balance. Things don’t disappear. Your garbage has been eaten by the food that we all are eating now. The whole point of this episode is to remind us to make less waste. This “moral foci” episode wouldn’t be made if this is not such an urgent topic we all need to think about. So please think about that. 99pi is surely the most consistently excellent podcast ever… so really disappointing to hear such bad, bad economics on this episode! Recycling is NOT cheaper if you used forced labor rather than paid labor for sorting; it’s more expensive, it’s just that the cost is hidden. Forcing people to sort their own recycling is like forcing people to do their own plumbing… it’s far more efficient to do whatever you do best, and use the money you earn from that to pay a plumber who can join pipes better than you can. Why is it acceptable to force people to sort their own recycling, when it’s clearly crazy to force people to do their own plumbing? The clue is in the “should” word heard in this episode. Please, 99pi, stay away from moral righteousness, try not to advocate counterproductive coercion and, if nothing else, learn some basic economics! Your mindset is quite misplaced. The point is to think more about your waste, which you are responsible of. Yes, you make more money when time saved from doing recycling, but equally you use that “more money” to buy more things that eventually turns into waste, which again you don’t have time to recycle because busy making more money/waste. This episode pins down the thing you don’t want to think about in your head— that is your garbage. And that’s why you come up with that counter-productive excuse to back up your laziness. Please… you can’t run away from your garbage. ^Who are these last two commentators??? “Counterproductive Coercion”? It sounds like bad spam bots. Plumbing requires a license. Sorting your recycling takes about 30 seconds. If sorting your recycling is like plumbing, it’s the equivalent of flushing your toilet. EVERY city all over the world has got to be better about trash. We’re destroying our oceans and planets. A follow up episode on ocean pollution and how we’re trying to clean them would be a great podcast. Listening to the episode I found the basic premise of trying to get across the point that we as Americans, should do more to recycle. What I found a bit ironic was that at the end of the program as you were going through your sponsors, one of them was Blue Apron, who by their very concept generates a rather large amount of waste from all the packaging of small amounts. I live in Tainan, where “The Maiden’s Prayer” is the garbage truck tune. (Hear it here: https://www.youtube.com/watch?v=dd8uR9qEBuc. Bored waiting for the truck, I composed 3 verses of doggerel to accompany it. Bring out your garbage and refuse, our truck is coming your way. And for the things you recycle, there’s one on alternate days. Environmental protection, a project worthy of praise. Batteries, lightbulbs and paint cans, these things are dangerous waste. Leftover food from the kitchen must go in it’s special place. Other things thrown on the truck will be burned, and pow’r generate. People who serve this department should not be called garbage men. A goodly number are women, in fact, about six in ten. 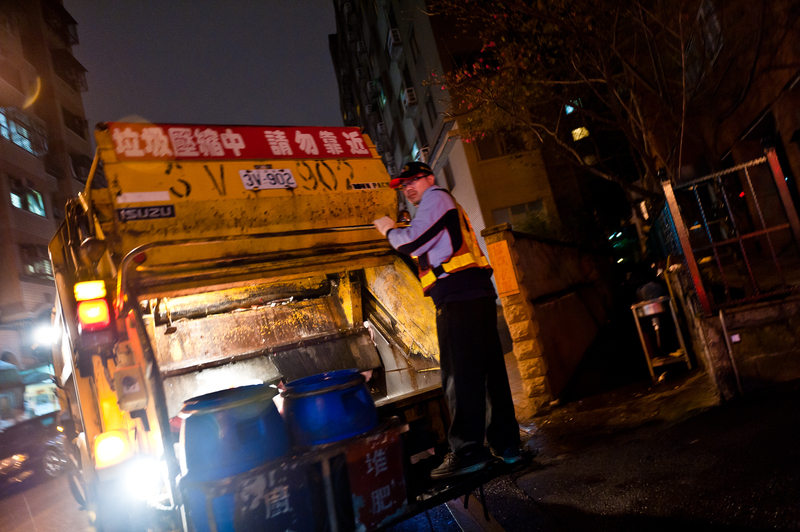 I lived in Taiwan for several years, and it was always funny the little scramble that the trash truck music would set off. It heard only Maiden’s Prayer where I was. When I told people that in the U.S., our trash trucks come only once a week, their faces would scrunch up in disgust. I tried to explain trash cans outside the house, but that didn’t seem much better. Ah, the strange things to be nostalgic for. Tekla Bądarzewska-Baranowska is pronounced Tekla Bondazhevska-Baranovska. Sorry, Roman’s pronunciation made me cringe. Otherwise, fantastic episode as always. I saw one of these things winding its way up a street in this town on the edge of a cliff in Taiwan. It was playing Für Elise and I can attest to the fact that people will come running out of their houses and up the street to catch one and throw in their garbage.